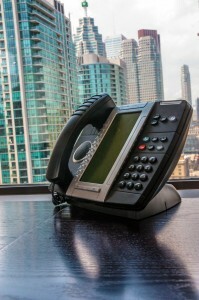 This is the phone you can have with your VoIP virtual office package. Last summer when in the wake of the torrential downpour and subsequent flooding of various neighborhoods around Toronto, Telsec Business Centres received a great deal of calls from small businesses looking for temporary office space. While some of those businesses have since moved back to their original office facility, others liked the office arrangement at Telsec so much, they decided to make it a more permanent office for their business. This Spring, a sudden thaw of heavy snow has also caused flooding in Toronto. The most interesting call for office space came from an existing virtual office client who ran his small design firm out of his basement. While little damage was done to his work, the work environment was not usable because it was under two feet of water. Within an hour of calling our office support team (who found the perfect team space for him), he showed up with his computer under his arms and was ready to get back to work. Even some small businesses that were not affected by this most recent disaster are now looking into disaster recovery planning and making sure they are prepared, in case they have to set up business in another location quickly, so as not to disrupt the work from getting done. One way for small businesses who do not have their own office telephone system to prepare for disaster recovery is to save money on purchasing a PBX system and on-premise hardware in their office space, by using a VoIP virtual office service. This way they can do business anywhere they can get Internet service. The other bonus is that because their calls are answered at a business centre by a professional receptionist. Additionally, their calls can still be answered while they are recovering from the disaster and keeping their business up and running. Having your important day-to-day computer files on a cloud server also helps to make disaster recovery much easier – because within hours you can be set up in a new office space with working telephones and Internet access to your files and work.